K. Siddhartha: How does El Niño affect the Indian monsoon? The El Nino and La Nina are atmospheric oceanic phenomenon driven by atmospheric circulation and is better called as El Nino Southern Oscillation (ENSO). The Southern Oscillation was discovered by Gilbert Walker over seventy years ago. It is an oscillatory pattern of weather between the Pacific and the Indian Ocean extending from Africa and Australia. It was discovered that when the pressures tended to be high over the southern Pacific they tended to be low over the Indian Ocean. The average period of this oscillation is 3 years, but it ranges from 2 to 10 years. The Walker circulation is a convective cycle/cell that owes its origin to the gradient of sea surface temperatures along the Equator in the Pacific Ocean. The Walker circulation is driven by major east-west pressure gradients set up by differences between air rising over heated continents and the warmer parts of the oceans, on the one hand, while air subsiding over continental areas where deep high pressure systems have become established, and in association with subtropical high pressure cells, on the other. Near the South American coast, the winds blow offshore, blowing the surface water westward away from the adjacent continental margins. To replace the blown away surface water deep cool water replaces the blown away surface water. This is called as upwelling. The air above this cool water gets stable because of cooling from below, convection is suppressed and thus, it cannot rise and join the normal meridional circulation. Instead, it flows westwards where it flows as South East Trade windsacross the South Pacific to warm the western Pacific where it gains moisture and also gets warmed. It then rises and flows eastwards to complete the cell. Each year in October, however, the Trade winds become weaker and the upwelling is reduced. The warm tropical surface water that was blown up against the western margin begins to flow back eastwards across the ocean’s eastern boundary, it further suppresses the normal upwelling along the coast. The weakening of the trades is related to the movement of the Indian low-pressure cell to the east, beginning in October and November. At the same time along with the eastward shift of this low pressure cell is the movement of the Inter Tropical Convergence Zone (ITCZ) towards south. The ITCZ’s normal seasonal migration is from 10°N latitude in August to 3°N in February, but during El Nino Southern Oscillation (ENSO) events it may move south of the Equator in eastern Pacific. This shift causes the weakening of the Trade winds. The warm surface waters remain off the South and Central American coast for an entire year or longer. Upwelling continues to be suppressed and reduced by the overriding warm surface water and the failure of the Trade winds to blow it away. The effect is called as El Nino “Christ Child” in Spanish). This appearance causes the air pressure to drop over large areas of the southeast Pacific near El Nino appearance while pressure rises over western Pacific near east of SE Asia. This see-saw variation of air pressure is called the Southern Oscillation. It has been known for some time that an El Nino has very different effects on the south-west and north-east monsoons. This abnormal warming of the equatorial waters of the central and eastern Pacific has often been associated with failure of the south-west monsoon. But the very same phenomenon appears to have just the opposite effect on the north-east monsoon, leading to more bountiful rain. Normally, the equatorial regions of South American coast are under the influence of the easterly trade winds. These winds drive a northward flowing cold ocean current. This is the Humoldt or Peru Current. it flows northward to about 5° S before turning westwards. But, once in a few years the trade winds suddenly weaken and even reverse their direction. The Humboldt Current then weakens and there is little or no upwelling off Peru. Upwelling refers to the ascent of deep, cold, nutrient laden water towards the surface layer of the sea usually by diverging equatorial currents or coastal currents that pull water away from the coast. It may occur anywhere, but is most common along the western coasts of continents. Driven by winds, blowing towards east, the surface waters of the Pacific basin tend to pile up near the western sector of the basin in normal years. The sea levels near Indonesia, for example, are nearly a metre higher than over Peru. But in an El Nino year they become nearly equal. And, there is a corresponding reduction in pressure over the southern Pacific because the easterly trades are weaker. This in turn influences the Southern Oscillation. The phenomenon occurs around the advent of Christmas. There have been years of deficient monsoon rainfall, which were not EI Nino years. This suggests that there are other factors, apart form an El Nino, which lead to poor monsoons over India. The relationship between the two is not very firm, but generally an El Nino is associated with a poor or different monsoon. As pressures are inversely related to rainfall, this suggests that when low pressures prevail over the Indian Ocean in the winter months, the chances are that the coming monsoon will be good in terms of rainfall. This fact is still utilized in long-range predication of monsoon rainfall. 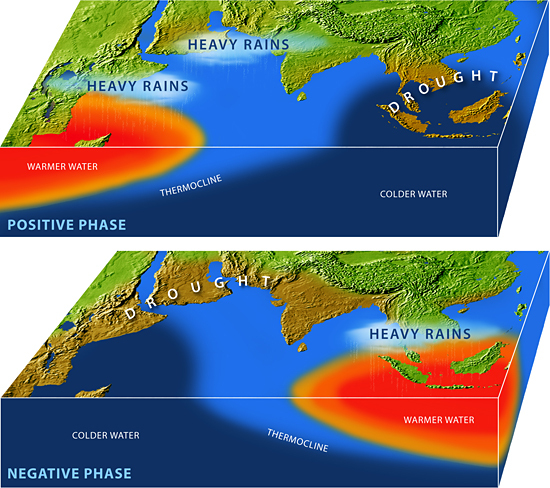 The Effect of El Nino on Indian Monsoon (top), Normal Condition (Below).